Britain faced one of the coldest nights of winter so far last night as temperatures plunged and melting snow froze over, leaving parts of the country covered in ice on Sunday morning. BBC Weather forecaster Tomasz Schafernaker said: “Tonight is when the real change arrives. We have got wet and windy weather splashing its way and blowing through the country, temporarily some snow across the Scottish hills but rain for the most part and those temperatures will be above freezing than this coming night. Last night it dipped down to -10C in some areas. This coming night it is going to be closer to say 5C and perhaps even 8C in the south-west of the country. Here’s tomorrow morning. But there is set to be a temperature split in the UK next week, with the north set to stay cold while temperatures in the south pick up. The Met Office has issued a yellow ‘be aware’ weather warning for western Scotland and southern and eastern England on Sunday for snow and ice on Sunday. The warning urges people to be wary of icy stretches, with travel disruption expected throughout the UK. The weather warning for snow and ice remains in place for much of Scotland until Monday afternoon. Roads and railways are likely to be affected with longer journey times by road, bus and train services as a result of the ice and snow. There is also likely to be some injuries from slips and falls on icy surfaces, the Met Office has warned. 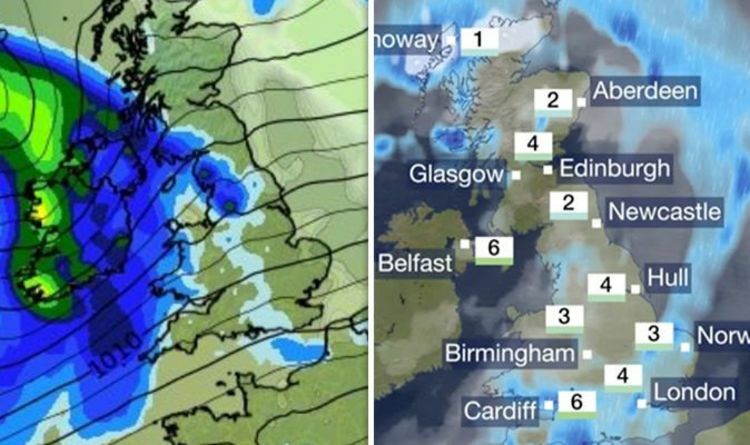 Met Office meteorologist Greg Dewhurst said: "Much of the UK's dry, but across the north-west and west of Scotland there are some snow showers. "There is a weather warning that will be in place from 7am onward as that band pushes eastwards. "It will be a cold, frosty start for many and then there is the risk of some more rain, sleet and snow coming into western Scotland by the end of the night into Monday morning."